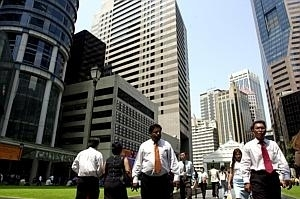 The employee turnover rate in Singapore is set to climb, according to a global study from management consultancy Hay Group. The figure for this year stands at a five-year high of 15.6 per cent, up from 14.1 per cent a year ago. This represents the proportion of the 194 Singapore employees polled who indicated that they planned to leave their job within the next two years. The study was based on a macroeconomic model that analysed staff departures in 19 countries, in conjunction with the Centre for Economics and Business Research based in the United Kingdom. It also drew on the Hay Group's opinion database of 5.5 million workers worldwide. Hay Group's regional manager Victor Chan attributed the rising turnover rate to an improved economy. He said: "The turbulent labour market associated with the economic downturn has held down turnover rates in many organisations. But as the economy recovers and global employment becomes less volatile, dissatisfied workers with pent-up frustrations now pose a significant flight risk." Mr Chan warned that this trend could lead to significant hiring costs and talent gaps for employers. Singapore will not be the only country to face this flight of workers. This trend is also expected to spike soon in the Asia-Pacific. Because of the mix of emerging and developed economies in the region, employee departures are anticipated to peak this year. China will face 21.3 per cent of staff planning to pack their bags, for example, while the figure is 25.8 per cent for Indonesia. Developed countries like Australia and the United States are expected to see a peak in employee turnover next year, with approximately 161.7 million workers worldwide leaving their jobs. The Hay Group study forecast an average turnover rate of 24 per cent in the Asia-Pacific and 23 per cent globally over the next five years, driven by the recovering global economy and the growth of an ambitious middle class. Said Mr Chan: "With the economy in Singapore growing favourably at 3.8 per cent on-year in the second quarter, firms must establish solutions to engagement and enablement challenges to keep high value employees from leaving in search of more favourable work arrangements." He recommended that employers take steps such as maintaining appropriate remuneration and promotion prospects, as well as improved workplace efficiency, in order to better retain in-demand employees.